Those who have failed in politics have paid for what they know, and those who pay for knowledge in the real currency of life are entitled to a hearing. I have not posted about books in a while. My reading has been sporadic so far this year. It is hard to believe that April is almost over and I have not been able to read all of the books from my Christmas stack. I go through periods of feeling overwhelmed by how many books I want to read. Frankly, even if I read as much as I'd like to, there still wouldn't be enough time to get through my book list. I hope that I will add more reading to my nightly routine. 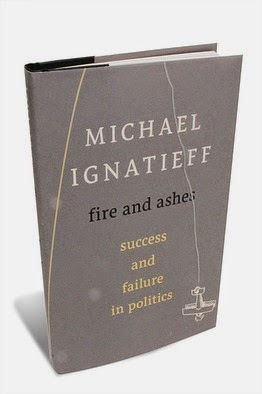 For the political types that follow my musings, Michael Ignatief's Fire & Ashes: success and failure in politics, should be on your must read list. Forget that he was a Liberal, or even that he exited politics after leading the Liberals to a historic defeat. This is a story of real politics in the modern age of the ruthless permanent campaign. I was not a huge Ignatieff fan but after reading his book, particularly the final chapter, my appreciation for the situation he found himself in increased. Some may read this book and say that he does not admit responsibility for the party's demise and his eventual decimation in the 2011 election. I feel, that, he never had a chance. He lacked a killer political instinct and was not particularly well suited for the job. As he admits politics requires basic skills, especially timing, that “can be learned but they cannot be taught”. It is one of those cases were many are called and few are chosen. He was sought after by the " Men In Black" , convinced that he was what the country needed. He had spent all but two of his adult years living abroad and he had no first-hand experience of politics at any level. He should have never left the ivory tower of academia for gutter of politics. This is a candid memoir. It is not a self-serving attempt to get back at those that savaged him. It is a sincere, authentic attempt to show how tough the game is and what it takes to survive, let alone win. He certainly conveys his own nativity regarding the realities of Canadian politics and the hurt that came with the "Just Visiting" ads that defined him. This candid book offers those that are serious about getting into the political game many valuable lessons. He never really deals with the issue of why he wanted to be Prime Minister, except that he wanted to see if he could handle the challenge. Perhaps, not having that fire in his belly - the thrust for the job made it that more difficult for him. A great deal of the book is committed to who has standing to talk about issues. How standing is earned or taken away. A failure in the political world, he certainly earned the standing to tell his story.